Discovered (or some say, rediscovered) in the year 157 AGW. The planet was so named for the engraving found on the side of the first piece of archeotech removed from the surface. 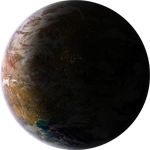 The Tribes refer to the planet as Middian in reference to their religious beliefs that the planet is the resting place of the mind of the sleeping god Kenshu. It is a large planet made up of multiple continents, several large bodies of water, and contains two MK.III gates (the only planet known to have multiple gates). In the years leading up to the final battle with the Thinking Machines, people who came to live in the main settlements of Eclipse found they had a tendency to work together, despite mutations, cybernetics, or psionic histories. There were simply too many other things on the planet to worry about. This sentiment remains true to this day, though now that the war has ended many question how long it will remain so. Atlantis – A plentiful land populated by a militant culture of people living in many principalities spread out from one coast to the other. The people here predate the coming of the colonists from the many planets of Origo. Formoria – A barbaric people given to raiding. Not much else is known of this continent. Hel – A poisoned, cratered horror. Presumably uninhabitable. It once bore a different name before it was blasted with radiation in some long ago war. High Asgard – The High Asgardians are known as sea raiders, and their ships are identifiable by their black sails. Not much else is known of this continent. Hyperborea – A continent poisoned with heavy metals as a result of an orbital bombardment against Hel (which was called by a different name at the time) during a war, presumed to have been the first war against the Machines. The settlements of Downings, White Falls, and the Compound are noted locations here. Less settled areas also include Gate Town and Station City. Lemuria – A sparsely populated continent looked after by snake men and a handful of mysterious women. Mu – A rich land with much to offer. The settlements of Elder’s Grove, Morgan’s Landing, and the Kree Archive exist here. Less settled areas also include Iron Town. Rylyeh – A large continent marked with a huge canyon of unknown depth into which water endlessly flows. Not much else is known of this continent. The Southern Continent – Unnamed, presumably uninhabitable and covered with ice. Zealand – A strange land ruled over by a dark queen. They have a long-standing enmity with Atlantis.